Evolution, The Religion Of Fools. In One Picture. I state for the record that I did not assemble this or see it assembled. It was there when I walked a route that I walked for the very first time. It simply stands as a brute fact. It is what it is. The only question is how it came to be the way you see it. Somehow, in some amazing demonstration of the power of evolutionary forces, a strong wind managed to lift one rock atop another. And then, without knocking that rock over off its new evolutionary perch, the wind managed to stack two rocks side-by-side on top of the second rock. Amazingly – and the miracle of evolution is clearly on display here – a fifth rock, and then a sixth rock and a seventh rock and then ultimately an eighth rock, were all successively and successfully stacked one atop the other by this marvelous Darwinian breeze. Now, maybe you believe that. Or maybe you’re not what the Bible labels “the fool” (Psalm 14:1) and you immediately realize what a total pile – LITERALLY – of abject idiocy the notion that this rock pile just happened all by itself clearly is. I truly did marvel when I saw this pile of rocks and contemplated the implications. Because I was very well immediately aware that SOMEBODY had very clearly put this together from the determination of a mind to create something where without a mind and a decision to create there would have been nothing. And everybody who isn’t a complete fool clearly knows that somebody assembled this monument; it didn’t just “happen,” it didn’t “evolve” by some random natural process. And as I shall shortly demonstrate with something called “science,” I don’t care how many billion years you want to wave at this monument to claim that it happened by itself. The longer you want to think it took, the worse the fool you are. This is a one-to-one, apples-to-apples, direct comparison: the rock pile did not happen by random, chaotic chance, everyone knows, because it is simply too complex of a structure to have happened all by itself. And the whole universe is SO much more complex that it is beyond foolish to claim that it happened by itself when we all know that something as simple as this stupid rock pile couldn’t have happened by ITSELF. And this principle is true throughout any legitimate science. I was watching a documentary on Julius Caesar and his defeat of the Gallic chieftain Vercingetorix at the Battle of Alesia in 52BC. Archeologists were able to fully discover the fortifications at Alesia by flying overhead and doing detailed photography of the area. And what they did was look for lines that were simply too symmetrical or too straight for nature alone to have been able to produce. Because they were demonstrating something called “common sense” that every evolutionist and atheist has none of whatsoever. It’s stupid enough to claim that something that nature cannot produce was somehow produced by nature, such as the straight, symmetrical lines revealing ancient Roman fortifications or the rock altar I photographed. But it is a level of stupidity beyond “dumb and dumber” to say that while nature cannot produce symmetry or design, it can somehow produce the infinitely GREATER complexity of the people who produce the things that even fools understand that nature cannot produce. Think about it; the atheist, the secular humanist believes that obviously nature cannot produce the simplest kind of order or symmetry, but these same fools believe as an act of RELIGIOUS FAITH AND NOTHING ELSE that nature can produce infinitely MORE complex order and symmetry in the so-called “evolution of life” that is GOOGOLPLEXIANS of times more complex. If nature cannot even produce so much as a straight line or a simple pile of rocks, please do not insult your own intelligence by claiming it somehow produced the Mona Lisa. I’ve got another one for you to riddle me. There’s just an awful lot more to reality than the eye can see. Things are vastly more complex than they appear. Science itself has taught us that. See, according to science, we’re a collection of particles, right? Atoms, molecules. There are 70 trillion cells in a human body consisting of about 7*1027 atoms (that’s a 7 followed by 27 zeros!). Atoms are by definition mostly made up of empty space. And so for one thing, we’re not solid. Truth to tell, we’re actually FAR more water (about 60%) than anything else. So then why are we solid? You’ve got theories, but we don’t really know. “We are spirits in a material world” is as plausible as anything “scientific.” And then what about this one: given that we’re a collection of particles, how or why are we a whole? How can this collection of particles consisting of atoms numbering in the 7 followed by 27 zeroes be one thing? And what about this notion of “I”: “I” am one thing! How can “I” be an “I’, let alone one thing as opposed to many different parts? What about this notion of consciousness and individuality? How does science explain that? Have you ever heard a scientist attempt to explain these things to you? You see, just as we can know BY SCIENCE that we CANNOT see everything with our physical senses – such as atoms, particles and molecules – we can also know that there is a realm beyond science, beyond the physical. We can know that just as there is a realm smaller than our senses, that there is also a realm bigger than our senses. There must be a realm that is beyond science, beyond the physical, a realm that has been called “supernatural,” but is surely metaphysical, above and beyond the physical. That’s why the Bible uses the word “fool” to describe such people who deny God and the supernatural. It’s frankly beyond merely idiotic. Atheists and evolutionists mock religious people for believing that a transcendent, personal, omnipotent God can do all things. But what do THEY believe in? The too-idiotic-to-even-qualify-as-“fairy-tale” notion that if something sits around for long enough, a MIRACLE will somehow happen. And no, boys and girls, time doesn’t possess magic power. All time does is sit there and do nothing. If I were to employ the evolutionists’ argument back at them, it would go like this: I promise that I will refute evolution and prove that it is bogus. In 4.5 billion years. Because all they do is turn that very same argument upside down and claim that something somehow happened that long ago when no one can even begin to prove that it did. It’s an assertion, nothing more. Which invites the question as to the nature of ALL of “nature.” We don’t just have the problem of explaining how the pile of rocks somehow got assembled into that neat little monument. We have the problem of the origin of the individual rocks themselves according to the Big Bang theory of cosmology held by nearly all physicists today: all matter, all time, all energy and all space suddenly exploded into existence at some finite point of time in the past very much as if Someone had declared, “Let there be light.” It’s as Robert Jastrow described it in God and the Astronomers: “For the scientist who has lived by faith in the power of reason, the story ends like a bad dream. He has scaled the mountains of ignorance; he is about to conquer the highest peak; as he pulls himself over the final rock, he is greeted by a band of theologians who have been sitting there for centuries.” Those rocks in that picture did not always exist; they came into being because they were caused to exist by something (or of course Someone). And it happened in a manner that confirms the account of the Book of Genesis chapter one. Jastrow – one of the great scientific minds of the 20th century – also stated: “Astronomers now find they have painted themselves into a corner because they have proven, by their own methods, that the world began abruptly in an act of creation to which you can trace the seeds of every star, every planet, every living thing in this cosmos and on the earth. And they have found that all this happened as a product of forces they cannot hope to discover. That there are what I or anyone would call supernatural forces at work is now, I think, a scientifically proven fact.” And after that “Let there be light” declaration that same Somebody somehow – and we weren’t there to see Who or how any more than we saw who assembled the pile of rocks in the above picture – stacked a pile of rocks on top of one another to assemble our planet, our solar system, our galaxy, all living things. And the fact that we are here as a result is very properly indeed the result of “supernatural forces” and properly called a MIRACLE. Atheists and evolutionists once confidently declared that there were a septillion (that’s a one followed by 24 zeros) planets capable of life. These arrogant, ostensibly knowledgeable fools were so wrong it is unreal. Every single time they send taxpayer-funded prayers to the heavens in the form of enormously powerful radio communications, satellites, unmanned spacecraft like Voyager, etc., it amounts to perennially unanswered prayers to their god or gods. Just as I contemplated the pile of rocks on the trail and ask the question, ‘How did this get here? Could it just have happened?’, we must likewise contemplate the brute fact of the universe that we observe: the nature of the fine tuning of the universe is mindboggling when you consider it. How did the fact of universe and the fact of life get happen? Did Someone create it – which is the prima facie conclusion of any creature possessing common sense – or did it just assemble itself the way we know that pile of rocks in the picture above could never have assembled itself? When you realize how many things had to happen in precise sequence and with infinite precision for us to be here at all – rather than residents from those septillion planets visiting us or contacting us the way we’re trying to contact “them” – it should occur to you to question why we are here at all. How did just the right sort of solar system to contain the planet that contains the rocks that yielded all the necessary building blocks for life get here? How did just the right sort of moon that orbits the planet in just the right way to result in a planet that contains the rocks get here? How did just the right sort of star with just the right characteristics to result in just the right sort of solar system and just the right moon result in just the right planet to contain those rocks get here? And I mean, I can go on and on and on. Because the level of complexity within the system of the universe is so far beyond mind-boggling that it is obviously the result of supernatural mind determining to create. Do you see my point here? When you can’t even so much as glance at a simple pile of what, seven rocks arranged one atop the other, what kind of fool do you have to believe to think that ALL of the many INFINITELY MORE COMPLEX systems and sub-systems that compose the universe all around that rock pile got here by chance without an Intelligent Designer? When you start to think about the system of the universe and the billions of sub-systems and the trillions of sub-processes within the system, you have to mock the fool who believes that all that we see around us just somehow happened by chance. Because that fool is in all actuality a far worse fool than the fool who would look at the stack of rocks above and conclude that it happened by chance. 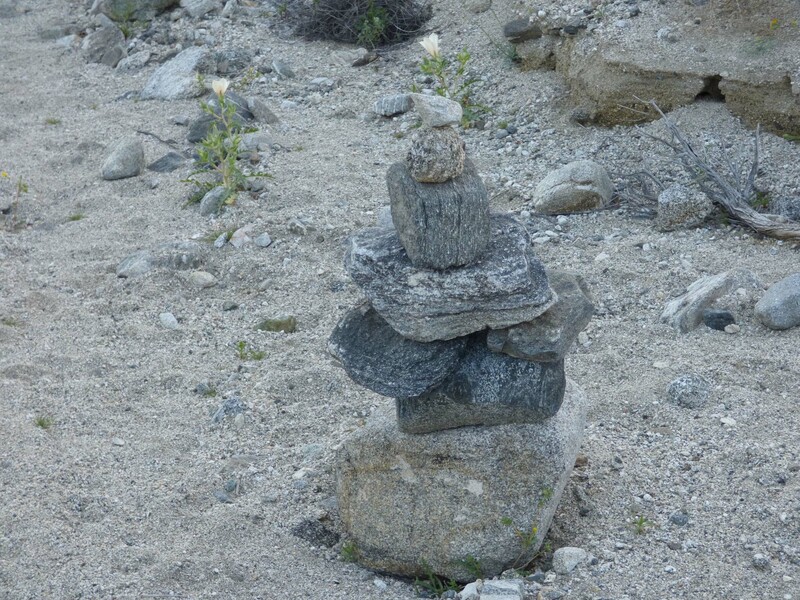 Look at that picture above again and consider the complexity of those seven rocks piled one atop the other and realize that it is far too complex a system to have happened by any act of random nature. And then go look at yourself in the mirror and ask yourself if you are not vastly more complex than that system which you obviously know was intelligently designed. And then keep reading to comprehend just how appalling the case for godless evolution truly is and the foolish idiocy you have to believe in order to deny the reality of God. How long did it take whoever built that rock pile to complete the job? I’m guessing a few minutes. Because our Creator God gave that person a miraculous mind and a fearfully and wonderfully made body to think about creating it and then an amazing body to actually make it happen. But the simple scientific FACT of the matter is that, no matter how long you want to claim the universe is, it STILL wasn’t anywhere NEAR enough time in the universe even times a million billion trillion to “evolve” the simplest cell there is apart from that Creator. You need to comprehend this: legitimate science can’t even begin to explain how just the proteins necessary for the simplest bacteria cell evolved by chance. And that the fool who postulates that “evolution” created the magnificent human mind that is so much more sophisticated and miraculous than any supercomputer ever designed is someone who seems to lack so much as that bacteria cell for a brain. Because we’re no longer talking about the simplest bacteria cell the origins of which science can’t begin to explain or even explain away; we’re talking about a brain jam-packed with billions of infinitely more complex cells in infinitely more complex arrays. Yes, all complicated things were very self-evidently designed for a purpose. And that Designer is God. Don’t be a fool and deny the obvious. It is OBVIOUS to even Richard Dawkins that the universe was “designed” for “a purpose.” The prima facie case is obvious and if you want to claim that there is no Creator you must prove beyond any reasonable doubt that there is NOT a Creator, rather than telling a bunch of fanciful atheist fairy tales to describe how things happened the way the most primitive cave men told stories about how we have wind because the trees are moving and swaying and creating the ensuing wind by their actions. The burden of proof necessarily falls upon the unbeliever; but they have performed a bait-and-switch by the most disingenuous means. You’ve got your pseudo-scientists who claim that this amounts to some argument about “science” versus religion. I call them “pseudo-scientists” because if you understand the history of science, these people are very clearly speaking out of complete ignorance – and legitimate scientists never speak out of such ignorance. The so-called “science” these pseudo-scientist ideologues embrace is every bit as “religious” as any serpent-handling Pentecostal who ever lived. You can’t use physical science to arrive at or derive the laws of logic; they are self-evident only within highly particular worldviews that are uniquely based on the presuppositional and foundational belief in the supernatural and the divine. We today have the denunciation of “Western logic” by the postmodern movement. Because Western logic is based upon the reality of “either/or.” And the moment you allow Western logic profoundly powerful “either/or” arguments such as the Kalam Cosmological Argument begin to pour in and drown the godless fire of atheist thought. Our Western laws of logic were derived from Greek thought, which was highly DUALISTIC. There were the gods and there were men. There were the non-material abstract and yet substantial Forms and there was the material world of change. You cannot accept the laws of logic and not accept the distinction between the material and immateraial world and the existence of the immaterial world which bequeathed us with the Form of logic that we aspire toward without being a pathologically dishonest hypocrite and an intellectual parasite. And as you contemplate the existence of “truth,” recognize that either our minds and our brains were created by a Truth-Knowing Being to know truth, or they are the result of a entirely random and unguided process and therefore no reason whatsoever to assert the capacity to possess “truth.” And in the same way, when it comes to the rise of science, any notion of genuine science pitted against genuine religion is a total fraud and fabrication. Modern science uniquely arose out of Judeo-Christian presuppositions from a geographical place and a philosophical worldview called Christendom. It arose out of no other worldview and never could have arisen out of any materialistic worldview. Science was allowed to rise because Judeo-Christian-worldview inspired men – ALL publicly professing Christians – believed that there was an orderly universe that was created to operate on orderly principles and that we as image-bearers of the Creator possessed the mental faculties to marvel at the work of the Creator and “thinking God’s thoughts after Him” – as Isaac Newton, the greatest scientist who ever lived, declared. Atheistic evolutionists are frauds and thieves who usurped an entire foundation upon which logic and science originated. True logic and true science mock these people, because true logic and true science come uniquely from a worldview that they reject. Their feet are firmly planted in midair. But these people are such complete fools that they walk like idiots without a foundation toward nothing. And she then proceeded to ask, “Would the Darwin believers take that standard as a scientific test for God?” Would they accept the burden of proving that “God could not possibly have created” us??? Is whatever thought that is floating around in your head merely determined by how your random brain atoms randomly arranged themselves? Or do you think rational thoughts because you are the rational, thinking image of a rational thinking God according to Genesis 1:26-27 who said “Come, let us reason together” (Isaiah 1:18). I can go on literally all day citing evidence that scientists and atheist/secular humanist philosophers claim that human free will is nothing more than some philosophically useless illusion, and that you are nothing but a meat puppet entirely conditioned by your DNA and your environment. Both atheistic-ideologue pseudo-science and the atheistic philosophy based on that atheistic-ideologue pseudo-science readily dismiss the notion of anything legitimately called genuine free human will. It is nothing more than an illusion, so please go back to your pasture, all ye mindless and soulless herd animals, and chew your cud until slaughter-time. As Richard Dawkins asserted in his atheist tome The Blind Watchmaker, “DNA neither cares nor knows. DNA just is. And we dance to its music.” And YOU neither know nor care and you dance to the music the way a puppet jerked around by strings uncontrollably dances to whatever random notion randomly enters your randomly-generated skull. If we are in fact created in the image of an invisible Creator God, then we are NOT meat puppets, for the God who created us in His image is no meat puppet. If there is no God and we are products of mindless, soulless evolution, then we are and can be nothing else and nothing more than meat puppets. If it is a fact that you are nothing but a herd-animal meat-puppet with no mind and no soul, there is necessarily another terrifying truth: you have no moral responsibility. And the worst people in the history of the world by any “moral” standard have no moral responsibility, either. And this terrifying fact is necessarily true both on an individual level and on a societal level. On the individual level, if free will is an illusion, as any materialistic system science or philosophy asserts, then how can you hold someone criminally or morally responsible for their actions that result from no free will of the person who is committing them? Further, if Darwinism is true, then Social Darwinism is necessarily entailed: if natural selection is your process for evolving into better creatures, in which the fittest members of a species survive, and both inferior members of species and inferior species themselves must perish to give way to the stronger, then why should it not be so in how we govern the world? Why shouldn’t we help evolution by eradicating the unfit so that the more fit can better survive in a world of finite and scarce resources? Adolf Hitler understood that under any consistent Darwinian view, there were the predators and there were the victims – and he made his Germany a predator. Maybe you want to argue that it is false that big fish eat the smaller fish or that lions eat the gazelles. But you’re wrong because they really do. Nazi Germany was without any question THE most “scientific” society on earth during the time leading up to World War II, and a consistent Darwinism was precisely their philosophy: if Darwinism is in fact “science,” then have the damn courage to embrace the crystal clear implications of that science and embrace some form of Nazism or Stalinism which both embraced evolution and thus made horror such as has never before been seen possible. A guiding philosophy of Nazism was completely and fundamentally compatible with any “science” of Darwinism that had the decency to be consistent: they called it “lebensunwertes leben,” or life unworthy to be lived. And they killed off all members of society that were not sufficiently fit to be adequate Darwinists. And if you are an evolutionist and you do not think the precise same way, you are either a coward and a hypocrite for not having the courage to be consistent and live out your view or you are tantamount to a slack-jawed idiot for not having the ability to logically comprehend the ramifications of your own worldview. You can mock that above link between godless Darwinism and Nazism all you want, evolutionist. But first I ask you to explain how your teacher Charles Darwin – the full title of whose book was, “On the Origin of Species by Means of Natural Selection, or the Preservation of Favoured Races in the Struggle for Life” – precludes you from believing yourself to belong to a “favoured” master race and then possessing the justification to wipe out all the other races you compete with “in the struggle for life.” And I’ll explain how my Teacher Jesus of Nazareth precludes me from doing so. “Christianity, sprung from Jewish roots and comprehensible only as a growth on this soil, represents the counter-movement to any morality of breeding, of race, of privilege: it is the anti-Aryan religion par excellence” [Nietzsche, “The Twilight of the Idols”]. And so, a good Nazi was a Gottglaubiger. Rather than putting “Christian” on personnel forms they wrote down “Gottlaubig” – representing a “vague pseudo-philosophical religiosity” – to indicate that, while they were not “godless communists,” they were most certainly not “Christian.” And unlike Christians and Jews with their weak and insipid morality, they were Nazis who were willing to grab the Darwinian bull by the horns and do whatever was necessary, no matter how morally heinous. Just as any true Darwinist would do if he or she had the courage of conviction. But to his inner circle Hitler said very different things than what he said publicly. Adolf Hitler sounds like an atheist to me. He certainly rabidly abandoned Judeo-Christianity as few other human beings ever have. And while the Nazis were cynically willing to exploit Christianity or anything else they could twist to manipulate people into following them, it was put in the form of “Almighty God has created the German people to be a race of supermen” kind of garbage. But think about that for a second: created by WHO and by WHAT PROCESS? Certainly NOT created by the “Jewish God” of the Old Testament of the Christian Bible; and certainly NOT created according to the creation account in the “Jewish Bible’s” book of Genesis. So WHO created and by WHAT process? By Darwinian evolution, of course. God threw His random evolutionary dice and His throw came up Nazi snake eyes. And Hitler would tell you that lie and any other lie he needed to tell you to twist your mind into following him. Proto-Nazi atheist and secular humanist philosophers such as Friedrich Nietzsche and Friedrich Delitzsch gave way to full-blown Nazis such as Martin Heidegger and Ezra Pound. And the toxic atheistic and secular humanistic evolutionist ideas of these toxic men had toxic consequences. Furthermore, the most brutal form of human government that ever existed was communism otherwise known as “state atheism.” Every single officially state atheist society has been a violent and vicious opponent of human dignity and human freedom. Every single one. – continue to bear murderous fruit. They seize upon the imperfect results of imperfect political system that depend upon an imperfect pursuit of a religious worldview, and replace it with a demonic system in which the Government BECOMES God and proceeds to crush everything and every one that gets in its way. Nazism and Stalinism have one thing in common: godless socialism. The intent of these movements was to replace God with Government in which Government became the Savior and the people were encouraged if not viciously driven away from embracing any worldview that had a place for a Creator God in it. Realize the left today would murder people on a scale that would even shock Adolf Hitler, if they could just get the power they wanted. You don’t even so much as qualify as a cow to these people. I mean, in their own words, you don’t even make it to the level of a slug. At least we merit equal status to a cancer tumor. I don’t think even the Jews under Hitler got that little respect. These rabid leftists evolutionists believe that earth randomly evolved. And in order to protect the result of random evolution they believe they must wipe out somewhere between half and 95% of all randomly evolved homo sapiens. You can bet none of these people are going to volunteer to walk into the gas chambers first, mind you. Realize “the absurdity of life without God.” Realize that apart from God, there is and can be no true meaning, purpose or value in your existence. And that is precisely how the state atheists and the secular humanists treat you the moment they get power over you: like a farm animal that can be slaughtered and should be slaughtered. And simple factual history proves it. It’s happened before and it will very likely happen again. The ideology might change, but the evolutionary/Darwinian worldview that underlies it guarantees the same contempt for the dignity of the human spirit that we’ve seen before. Whatever you are, what you are not is either morally intelligent or in any way wise. Rather, as Romans 1:22 puts it, “Professing yourself to be wise, you became a FOOL.” A fool so captured by empty philosophies and high-sounding nonsense, as Colossians 2:8 points out, that you abandoned the real world for an atheist fairy tale in order to childishly ignore the authority of God and thereby ignore His moral commands. Unbelief does not come from intellectual causes or objective analysis of the data or any form of legitimate science. In fact science exists BECAUSE of the Judeo-Christian worldview and it arose in Christendom based on the Judeo-Christian worldview and the Judeo-Christian worldview alone. Rather, unbelief is a moral collapse by which wicked people do not seek God because they refuse to be responsible to Him and acknowledge that He alone is sovereign and He is the Creator and they the creatures. They resent any limitation on their ability to do as they please, or, according to their meat-puppet, herd-animal doctrine, whatever random string of atoms masquerading as a thought or a desire compels them or stimulates them to mindlessly act out. They resent any limitations to their mindless DNA-puppet-dangling animalistic autonomy. They refuse to honor any moral boundaries that they despise and so they therefore refuse to acknowledge the Boundary Maker. So if you want to think of me as being an idiot for believing in God, that’s just fine; provided you realize that YOU are the idiot of all idiots and frankly THE most idiotic idiot who ever lived in comparison to people like me. I mean, please don’t sneer condescendingly at me for believing in God given the fact that evolution is a fairy tale for fools. If there is no God, then there is no “truth” anymore than there is a “creation,” because “truth” is however the hell the molecules in our brains randomly arranged themselves to believe. If the human mind is mrely a randomly-generated product of natural selection, then the ideas in our minds were selected purely for their survival value and NOT for their truth-value. And so your “truth” – whatever the hell that is – is by definition of evolution no less random than mine. Evolutionary epistemology commits suicide. If Darwin’s theory of natural selection is true, “the human mind serves evolutionary success, not truth,” as John Gray expressed it. But consider the ramification and the ensuing contradiction of Darwinism: if Darwin’s theory is true, then it “serves evolutionary success, not truth.” In other words, if Darwin’s theory is true, then it is not true. It has been a simple game for philosophers to devise all sorts of scenarios which demonstrate that something might facilitate “evolutionary success” and yet be patently false beliefs. I can document prominient politicians and even journalists such as Walter Lippmann – who said that “The common interests very largely elude public opinion entirely and can be managed only by a specialized class whose personal interests reach beyond the locality” – to document that people have been inspired to take actions that others deemed the best course based entirely on propaganda or lies. Lets let smart people deceive stupid people into policies for their won good, they say. We just saw that that described as being the mindset behind ObamaCare from one of its chief architects. There is absolutely no connection whatsoever between something that could be an “evolutionary success” and “truth.” And in fact history is replete with examples demonstrating that “truth” has frequently been done away with to pave the way for something that has been passed off as being for the people’s own good. This is an epistemological box that evolution simply cannot climb out of no matter how many billions of years of fervent, fanatical faith in random evolutionary processes they want to throw at the abandonment of truth inherent in their theory. If this were anything resembling true science evolution and atheism and secular humanism would have been thrown onto the ash-heap of failed ideas. But we’re NOT talking about anything resembling legitimate science; we’re talking about a fanatical religious movement masquerading as science. That was one of the powerful realizations I had years ago as I considered the FACT that if there is no God, then all things are equally possible, and there ARE no boundaries and no morals and that everything I believe is right and everything I believe is wrong are nothing but mere arbitrary constructs of a constantly evolving culture. And I am NOT the kind of thing that dances to the music of DNA or follows some constantly-shifting morality like some mindless farm animal as Hollywood tells me what is right and wrong this morning; I am a human being created in the image of a rational, moral God Who will one day hold me accountable for what I did in this world that He created and placed me in. Unlike the animals, who see it get dark when I watch a beautiful sunset, I have eternity in my heart. Which means I can contemplate my existence after I die and leave this earth. I am NOT an evolutionary meat-puppet farm animal; I can know the truth. And the truth can set me free. I believe in God as the reason we have a universe containing life in it because it’s every bit as obvious and every bit as self-explanatory as it is for me to believe that those rocks in that pile didn’t happen by themselves. God designed us to be free and to be accountable to the nature that He imbued in us as His image bearers. And He created a world in which to place us. I am free because God set me free. And when I look upon the stars at night and contemplate their wonder, I give praise and honor to the God who is so much bigger than the universe that He created. I thank Him for giving me a place within His vast and beautiful creation. And I glorify Him for loving me as I look up in divine awe searching for His face.